Today, 15 Bytes features Utah native Zoe Murdock who provides excerpts from her new novel, Man in the Mirror: A man finding himself as he loses himself to Alzheimer’s (H.O.T. Press, 2016). 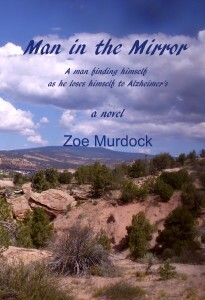 The book tells the complex story that follows the adventures and heartaches of Aaron Young as he attempts to keep his freedom and his feeling of self-worth as he descends into Alzheimer’s. As you can see from the excerpts, this is not your standard story about Alzheimer’s. So curl up with your favorite cup of joe, and enjoy the work of Zoe Murdock! By the time Aaron got home from the cemetery, the rain was coming down even harder. 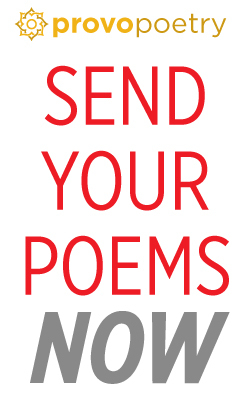 Not wanting Laura’s poems to get wet, he left the binder in the truck and made a mad dash for the house. He ran through the rooms opening all the windows. Then he went and stood in front of the living room window feeling exhilarated by the storm. It took him back to those drenching monsoon rains in India when the naked young kids would run out into the streets to play in the rain and the mud, twirling around with their arms in the air like those whirling dervishes he’d seen when he was over there during the war. He felt like doing something like that now. Something outrageous and free. Tearing off his wet clothes, he raced outside and ran barefoot across the lawn. He turned his face to the sky and opened his mouth to the downpour, like a man dying of thirst. Then he held his arms out and spun around like a dervish, going faster and faster until he could see the water flying off his fingertips. Pretty soon, his head was reeling, and he was gasping for breath. He sank to the ground and lay there feeling the cool slick wetness of the grass on his back. He stayed that way until it suddenly occurred to him that the neighbors up on the hill might be able to see him. The idea of them sitting up there watching the crazy ol’ naked man lying in the rain got him laughing so hard his stomach started to ache. Then, suddenly, he was crying, and there was a loud wailing sound that he knew must be coming from him. It sounded just like that terrible wailing he’d done after Laura died and he realized how utterly alone he was. The sign to Hurricane was right up ahead. Aaron slowed the truck and pulled to the side of the road, trying to sort out his feelings. This crazy homeless hitchhiker had almost got him killed, so why was he so desperate to take him out to his special place in the desert. It didn’t make sense. He’d be better off without him. Daniel’s smoke hit Aaron in the face, and before he could stop himself, he coughed and said, “I thought I told you to breathe that poison out the window.” Immediately, he wished he hadn’t said anything, but the smoke really bothered his eyes. Aaron sighed. “And could you please stop cussin’.” He was feeling worn out and defeated. Maybe he should just forget the whole thing. Aaron got to Beaver, and decided to stop for gas. As he was headed back to the freeway, he saw a van pull over and drop off a young woman near the on-ramp. Something about her rainbow colored clothes caught his eye. She was carrying a big camouflage duffel bag that looked a lot like the green duffel bag he had when he was in the service, only this one was blue with white splotches. As the van pulled away, the girl dropped her big duffel bag at the side of the road and stuck out her thumb. So she was a hitchhiker, huh? Aaron didn’t usually see girls out on the road and never one this young. He decided he’d better pick her up before someone else got a hold of her. “Uh . . . thata way.” He pointed south. “Wow. That’s so amazing. That’s exactly where I’m going.” She bobbled her head, and that set her mass of crazy gnarled braids bouncing in all directions. It was a peculiar hairdo, but it looked good on her. That was nice. Laura loved blue too. And there was something else about the girl that reminded him of Laura. Not her appearance, but the way she looked at him, meeting his eyes straight on with her shiny green eyes, showing a lot of interest in him like his Laura used to do . . . back when she was young. “Oh, sorry, I was thinking about . . . something.” He opened the passenger door for her to get in, then he ran around and got in himself. “Psychic? Uh . . . I don’t think so. It’s just that you seem to have a lot of . . . stuff in that bag.” He tilted his head toward the back of the truck. He scratched his head and shrugged. He didn’t have a clue what she was talking about. Aaron stared straight ahead at the white lines flashing by on the highway as he tried to figure out her words. She seemed to be speaking English, so why was it so baffling? From the corner of his eye, he could see her hands flying like birds as she talked, and her braids were jiggling again and making a kind of clacking sound. He glanced over to see what it was. No, it wasn’t the braids clacking, it was those colorful beads she had woven into the braids. Small red and blue and purple beads. They made a sound sort of like wind chimes clacking in the breeze. He glanced over again and realized she didn’t have a bit of makeup on. None of that black goop around her eyes like a lot of young girls wore. No rosy red on her cheeks. She was just a pure natural beauty, like Eve in the Garden of Eden, the way God meant her to be. He liked that. Zoe Murdock studied creative writing in the master’s program at the University of Utah. She is a native of Utah, which is the setting for her two novels, Torn by God: A Family’s Struggle with Polygamy and Man in the Mirror: A man finding himself as he loses himself to Alzheimer’s. She currently lives in Ojai, California where she and her husband, Everett E. “Doc” Murdock, teach an on-going advanced fiction writing workshop. 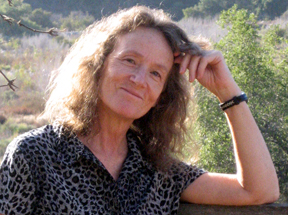 She has been a featured writer at Ojai WordFest and is co-editor of the FictionWeek Literary Review. 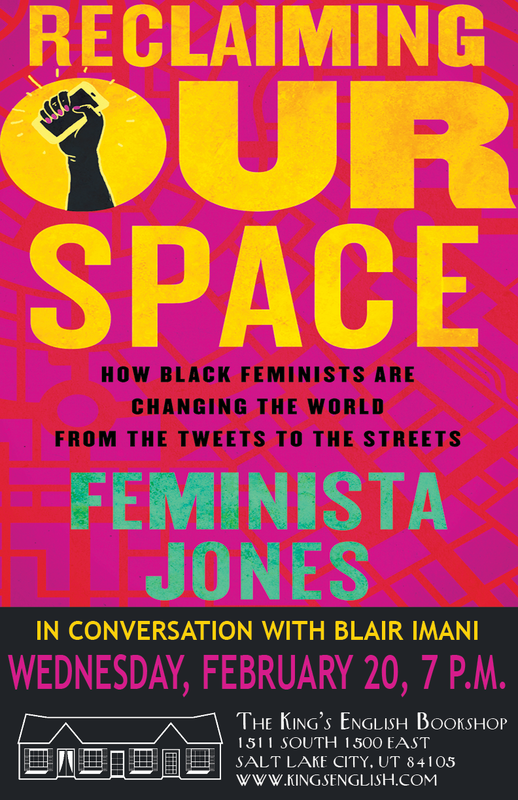 You can reach her author’s page on Amazon here. Past featured writers in 15 Bytes’ Sunday Blog Read: Katharine Coles, Michael McLane,Darrell Spencer,Larry Menlove,Christopher Bigelow, Shanan Ballam,Steve Proskauer,April Wilder,Calvin Haul, Lance Larsen,Joel Long,Lynn Kilpatrick,Phyllis Barber, David Hawkins,Nancy Takacs,Mike Dorrell,Susan Elizabeth Howe, Star Coulbrooke, Brad Roghaar,Jerry Vanleperen,Maximilian Werner, Markay Brown, Natalie Young,Michael Sowder, andDanielle Beazer Dubrasky, Kevin Holdsworth, Jacqueline Osherow,Stephen Carter, Alex Caldiero, Stephen Tuttle, Raphael Dagold, David Lee, Lisa Bickmore, Kirstin Scott, Jesse Parent, Craig Dworkin, Laura Stott, Jana Richman, Melody Newey Johnson, C. Wade Bentley, Amy Brunvand, Janine Joseph , Paisley Rekdal and Anne Vinsel.